Camelia by KlabHouse is a modern apartment for 4 guests with private garden and terrace, private entrance, direct access to the beach, WI-FI and air conditioning. It is located in a villa facing the sea within walking distance to the beach. The two bedrooms apartment is surrounded by a beautiful citrus trees garden and has a large fully equipped terrace for alfresco dining or just to relax enjoying the sound of the sea. Conveniently located in Lumia just 20 meters from the beach and 5 minutes drive from the center of Sciacca, thanks to its appropriate location between Selinunte and Agrigento it is the ideal destination for those wishing to spend their holidays in contact with the sea and nature do not skipping the many cultural attractions that our country can offer. Sciacca, ancient Arab center - Norman, overlooking the Sicilian channel is famous for its spa, for its historical center rich in history, for the port where the fishermen every day directly sell their catch and for the many restaurants offering fantastic local specialties. Within the property there is a guardian responsible of security and of the welcome of the guests. Stunning new three-room flat for 4 guests with private terrace, private entrance, direct access to the beach, WI-FI and air conditioning located in a villa facing the sea within walking distance to the beach. DEPOSIT: € 100 that will be returned on the day of departure, if the apartment has not suffered any damage. We stayed 4 nights here in October 2016. Great access to beach and town. Beautiful villa. Will return!! Die Anlage ist neu, leider sind nicht alle Arbeiten abgeschlossen. Die Tür zum Bad konnte nicht verschlossen werden, es fehlten Ablageflächen und Haken für Handtücher etc.. Das WLAN war nur schlecht zu empfangen, hier sollten noch einige Accesspoints eingerichtet werden. Die Klimaanlage konnten nicht geregelt noch abgeschaltet werden. Dieses musste der Service erledigen. Ansonsten ist die Anlage zu empfehlen. Sciacca is located on the coast of the Strait of Sicily between the mouths of the rivers Belice and Platani, about 65 meters above sea level: the east rises Mount San Calogero 386 meters high. It's one of the busiest ports of the island and its main activities are agriculture, fishing, crafts pottery, coral and tourism. Rich of monuments and churches, it is known among other things for the production of ceramics and its historical carnival. To visit: the Cathedral, the majestic Steripinto Palace, the Church of Santa Margherita, in Gothic-Renaissance style, the Door of San Salvatore. One of the most important religious celebrations of Sciacca is the feast of Madonna del Soccorso, the patron saint of the country, celebrated on February 2 and August 15. The celebration born in the seventeenth century as a result of an epidemic of plague, and legend tell that the statue was found in the sea and carried in procession by the fishermen. The sea is crystal clear, the coast presents inlets formed by fine sand and rocks. Sciacca is rich in thermal waters that still flow plentifully from the soil, there are the famous Stufe di San Calogero two natural caves with a great steam sauna. 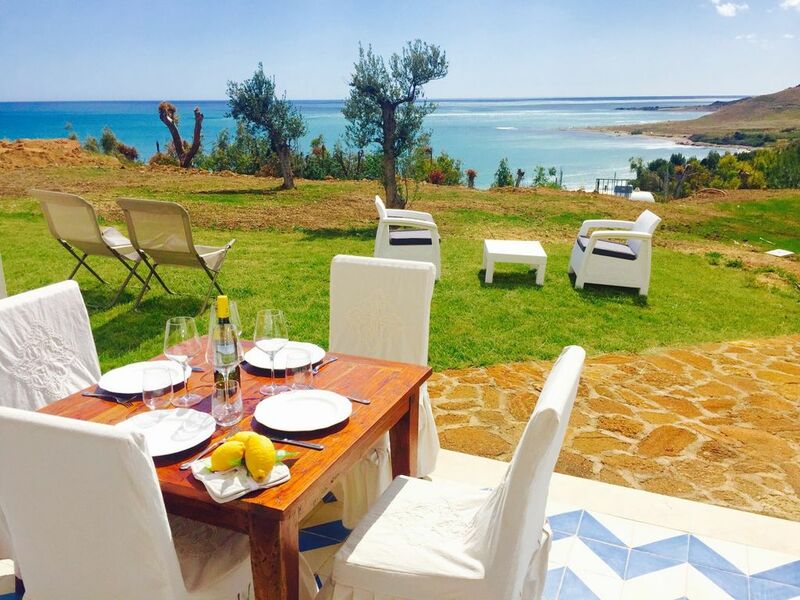 The famous beaches of Lumia, Timpi Russians, St George, Makuda are just a few kilometers from Sciacca. A 10-minute drive from Sciacca is located the Verdura Golf: three links-style golf courses use the natural, green contours of the landscape and are planted with indigenous trees and shrubs. Warmed by the Mediterranean sun and refreshed by the sea breeze, the courses are free from any buildings, offering uninterrupted views of the azure waters from the undulating greens. Three stunning golf courses that are part of the complex Rocco Forte Verdura Golf & Spa Resort at just 4 km. CAUZIONE: € 100 che verranno restituite il giorno della partenza, se l'appartamento non ha subito danni. DEPOSIT: € 100 that will be returned on the day of departure, if the apartment has not suffered any damage.